Penn’s Kingsmen celebrated Senior Night in 2017 by capturing a share of the Program’s 36th Northern Indiana Conference Championship and seventh in a row. 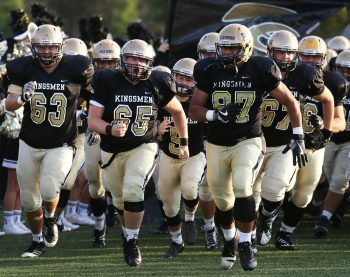 The Kingsmen beat Elkhart Central 47-3 to clinch a share of the NIC North Division crown on Friday, Oct. 6. Penn can win the title outright in the season finale with a victory at Mishawaka on Friday, Oct. 13. Hunter Whitlow scored on a 2-yard run on Penn’s first drive to put the Kingsmen on top 7-0. Ryan Whiteman scored from the two as Penn built a 14-0 halftime lead. Camryn Szynski ignited a huge second-half for the Kingsmen with 23-yard Pick-6 for a Kingsmen TD. Whitlow scored his second TD of the night on the next possesion for the Kingsmen, a 10-yard run to put the Kingsmen up 27-0. Zach Usenick made a sensational over-the-shoulder catch on a pass from Ryan Lynch for a 37-yard TD. Trenton Horvath added touchdowns of 60 yards and two yards to complete the Kingsmen scoring. Penn is 7-1 overall and 4-0 in the NIC North.